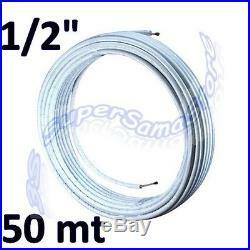 1/2 – 12.70mm Pre-insulated copper PIPES for A/C & REFRIGERATION. Foamed polyethylene INSULATION for piping. AND DO NOT HAVE CONNECTING NUTS. CU-DHP 99.9 EN 12735-1 regulation Tube diameter. 1/2 – 12,70 mm. Tube thickness: 0.8 mm Roll length: 50 meters insulation Material: polyethylene foam (LDPE) Insulation thickness: 10 mm Color: White Self-extinguishing: class 1 Operating temperature: -80 ° C to +98 ° C. ALL for air conditoning. A/C FLUSHING & CLEANING. È un marchio gestito da Samà s. So Promessi Sposi, 23 B, 23900 Lecco tel. The item “3S NEW COPPER PIPES AIR CONDITIONING PRE INSULATED 1/2 50 meters REFRIGERATION” is in sale since Thursday, February 27, 2014. This item is in the category “Home, Furniture & DIY\Heating, Cooling & Air\Air Conditioners & Heaters\HVAC Parts & Accessories”. 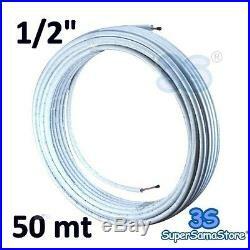 The seller is “supersamastore” and is located in Lecco, LC. This item can be shipped to all countries in Europe.